The Bergerac region, just to the east of Bordeaux, shares many aspects in common with its better-known neighbor to the west. Reds are made primarily of Caberernet Sauvignon and Merlot with a touch of Cot (Malbec) while the whites are mainly Sauvignon Blanc and Semillon with a bit of Sauvignon Gris and Muscaelle. Chenin Blanc, Ugni Blanc and others are also grown. Vines were first established by the Romans, and after a nasty interlude under the Saracens when the vines were ordered pulled up, the region has been a wine producer since the 1200's. On the western border of Bergerac, bordered by Bordeaux and the Dordogne River, lies the appellation of Montravel. 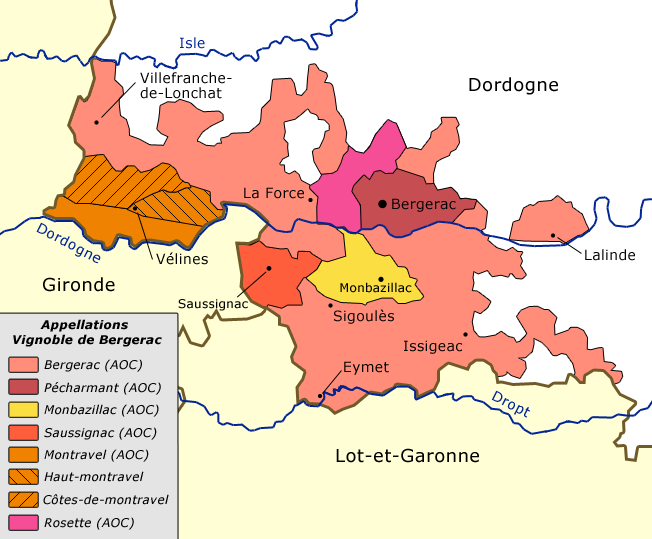 Like the surrounding appellation of Bergerac, the wines are produced from the classic Bordeaux varieties. At the heart of Montravel lies the village of Montcaret. The town dates to Roman times when it sat on the intersection of the roads from Bordeaux to Lyon and Cahors to Lalinde. Destroyed during the Frankish invasions, the town and villa recovered and prospered until the Gothic invasions of the late 5th and 6th centuries, then was once again rebuilt and destroyed multiple times during the Saracen invasions of the 6th and 7th centuries, then the Viking invasions of the 9th. Around 866, the first fortification was built at Mont Ravel (the Mount of Revelation). This evolved over the next five centuries into one of the most important fortifications of Aquitaine, and a site of contention between the English and French during the Hundred Years War (1337-1453). A center of Protestant rebellion, the citadel was finally destroyed by the armies of Louis XIII in 1622. Just over 2 centuries later, the present Chateau de Montravel was built on the ruined foundations of the citadel. The Chateau is presently owned by Philippe & Annette Blandinieres, who have spent the past decade restoring the house and gardens, orchards, groves and vineyards. The Chateau de Montravel’s vineyards are on the same ridge that extends east from Saint Emilion, a ridge of limestone overlain by a clay-based soil. This cool soil is perfect for Merlot, but inappropriate for Cabernet Sauvignon, which prefers a warmer, sandier soil. Today, the Chateau produces two wines, one of pure Merlot and one of 100% Semillon. Because the Montravel appellation, named for the Chateau in 1936, requires both reds and whites to be multi-variety blends, these stunning wines are classified as "Vins de France." And because the Montravel name is now a legal appellation controlee, the wines are bottled under the Chateau-M label. 100% Semillon from a single acre of 60-year old vines grown on clay/limestone soils. The wine is completely hand harvested and vinified with no oxygen to preserve the fruit aromatics. Vinified with extensive lees contact, the wine is then allowed to rest for 12 months in a mix of 75% French and 25% American oak 1/3 each new, 1-year and 2-year then aged a minimum of 2 years in bottle before release, the wine is compelling with a rich mouthfeel, great acidity, well-integrated notes of oak and a persistent finish. Styled as a food wine, it’s a perfect match for rich shellfish, light cream sauces, poultry or a triple-creme cheese. The wine will age beautifully for a decade or more. 2,000 bottles produced annually. 100% Merlot from 1.5 hectares of 60-year old vines also grown on limestone. Individual vines that have died off over the years have been recently replaced and some of the younger fruit should come online with the 2018 vintage. The wine is completely hand harvested and hand vinified. Grapes are completely destemmed by hand including the tiny stem “pip” on each grape to eliminate any harsh tannins or green flavors. Vinified with frequent pumpovers to extract color and matiere, the wine sees 18 months in 50% new and 50% older oak, a mix of 75% French and 25% American. There is no use of sulfites in the vineyard or during the primary or malolactic fermentations, and only minimal addition during barrel aging. Rich and intense, with great structure and finesse imparted by the limestone soils, and a long finish. This is Merlot the way it is supposed to be; bright, vibrant and full of savor. Approximately 4500 bottles produced.